Stuck a woody in a...wait, that sounds bad. 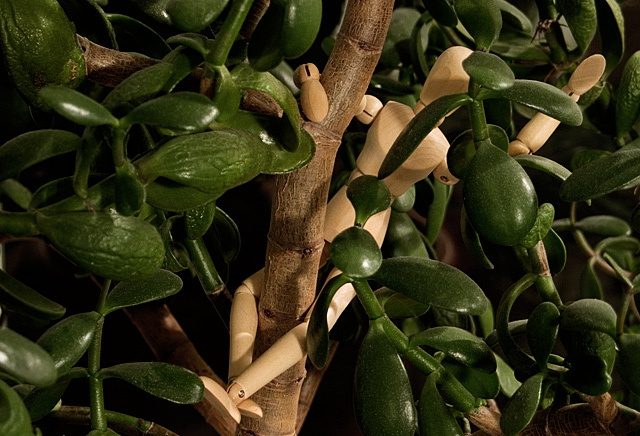 Placed my wooden mannequin in our jade plant. Took one pic, here it is! Random overhead light on in the room. Great dof and focus. My eye isn't sure whether to focus on Woody or the plant, though. Cute, but doesn't do it for me. I think the light spots on all the leaves is very distracting from the overall image. and for some reason it looks like a plastic woodie. What a fun idea & nice execution of the idea. He should have painted himself green, lol. good job and use of a jade lant. Pretty good cover, there, Woody! Proudly hosted by Sargasso Networks. Current Server Time: 04/25/2019 11:49:19 AM EDT.